'Rahu' is a planet that is unique to Vedic astrology. 'Rahu' can be considered to be a mythical planet, as astronomically there is no such planet in the solar system. However, do not mistake mythical with non-existent, as Rahu's effects are very real. 'Rahu' and 'Ketu' are twin planets that are described as being the dragon's or serpent's head and tail, respectively and are essentially malefic in nature. When these two planet form a certain aligment such that they encompass the remaining planets in a chart, they are considered to form a 'Kal Sarp Yog'. This aligment is generally considered to be inauspicious as this tends to cause hardships and struggles, depending on the house that it aspects. As explained above, 'Rahu' is the dragon's head and in ancient Hindu mythology, 'Rahu' belonged to the demonic domain. During a struggle between the Gods and demons to claim a pitcher of the elixir of immortality, Lord Vishnu severed Rahu's head from his body and all that remained were his head and tail. However, Lord Shiva compensated 'Rahu' and 'Ketu' for the harsh punishment inflicted upon them by making them a part of the nine Vedic planets, or the 'Navgrahs'. In Vedic astrology, Rahu is often described as being a 'Shadowy' planet. This is a reference to the effects and belief about the existence of this planet. 'Rahu' belongs to the Saturn group of planets and can be considered to by a malefic counterpart to Saturn. However, 'Rahu' is also considered to be able to cast a shadow over the Sun, depending their placements in a chart and their respective degrees of strength. 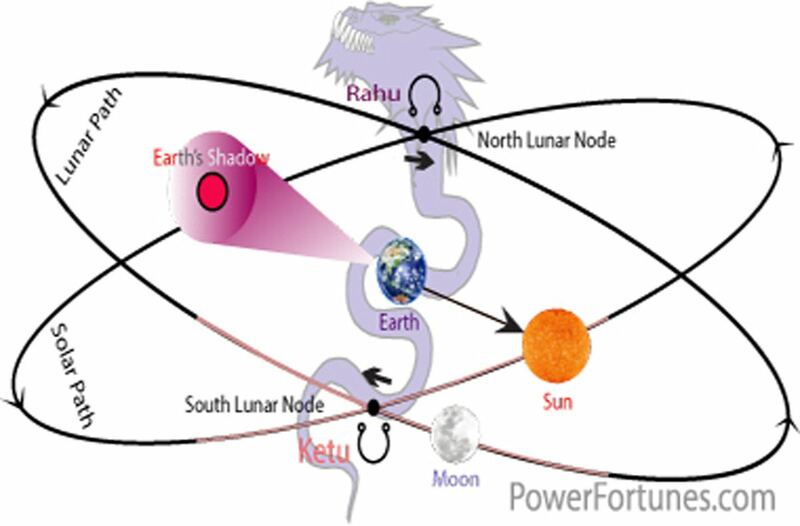 Mythologically, 'Rahu' is said to be responsible for solar eclipses, as it swallows the Sun, however 'Rahu' cannot contain the Sun as this emerges out of Rahu's open neck. Although there is no actual planet that denotes 'Rahu', some schools of thought hold that 'Rahu' may be a black hole that swallows everything. According to an astronomical theory, white holes may be the opposite ends of black holes and astrologically speaking, these white holes may be representative of 'Ketu'. In certain cases, a transit of 'Rahu' can have the effects of causing financial loss, as if money is being poured into a bottomless pit, similar to the manner in which a black hole devours matter. In Sanskrit the Dragon's Head is called 'Rahu' and this name is used in Vedic astrology. 'Rahu' this planet essentially denotes Saturn and is a shadowy representation of Saturn. It signifies courage, malice, endless desires, an insatiable lust for life, material and carnal desires, love affairs, legal problems, struggles, dissatisfaction, fear and wanderings. Rahu is often described as a demon who does his best to plunge any area of one's life he controls into chaos. It is the lord of Virgo. It is exalted in Gemini, and debilitated in Sagittarius. Defective eyesight, internal ailments and ailments related to the head are the main health problems that 'Rahu' is responsible for. The corresponding gemstones for 'Rahu' are hessonite and agate. It is the lord of south-west direction. The corresponding colour for 'Rahu' is black. According to numerology, Rahu's number is '4'. The direction associated with Rahu is, South. The corresponding talisman for 'Rahu' is the 'Rahu Yantra'.